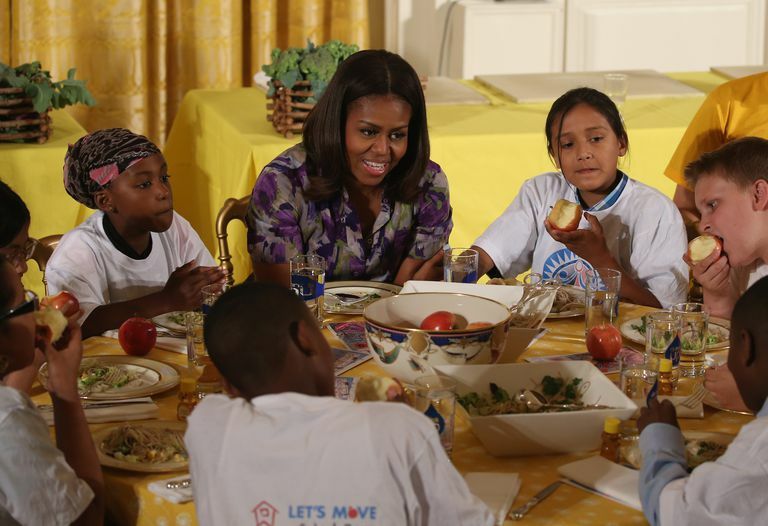 Mrs. Obama speaks frequently and movingly on child obesity. Obesity quotes certainly aren't all that define First Lady Michelle Obama. But as part of her ambitious campaign to eliminate childhood obesity in one generation, Mrs. Obama often speaks about kids' health, nutrition, and fitness. These passionate and compassionate quotes are a sample of some her comments on these topics. The Founding of Let's Move! The Impact of Let's Move! "Over the past five years, we have truly changed the culture around healthy eating and living in this country. Food companies are racing like never before to create healthier versions of their products. Even convenience stores are selling fruits and vegetables. Head to the local drive-thru and kids’ meals might include apples and skim milk. "Schools are growing gardens. They’re moving beyond just pizza and tater tots to lunches filled with fresh produce and whole grains. Companies are actually rewarding employees for eating right and going to the gym. And it seems like everyone’s running out to buy those fitness bracelets. Five years ago, all this stuff would have been considered cutting-edge, but now, today, it’s our new norm. "It was eight years ago that we cooked up this really interesting idea that maybe we could dig up some dirt on the South Lawn ... and we would plant a wonderful garden that would be a space for us to talk about the food we eat. And it was always the idea that we would have kids very involved in everything that we do. "Because of your passion and your dedication, in just three short years, 500 communities across America have joined Let’s Move! Cities, Towns, and Counties. Let’s just take a moment to think about what a day in the life of a child in a Let’s Move! City, Town or County might look like. "Start in the morning. That child wakes up, takes a ride or walk to school on a bike path or sidewalk that you paved. Now, when that child arrives at school—or maybe at a summer nutrition site—she might eat a healthy breakfast, and then later, a healthy lunch. Why? Because you expanded your school meal programs. "So now it’s time for recess. That child might run around in a nearby field because of a joint-use agreement that you signed. And then she might head to an after-school program, maybe a sports league that you started. And maybe, later on, she goes home to her parents where they cook her a healthy dinner using the MyPlate guidelines from a poster that you put up somewhere in your city. Then it’s later on in the evening, after dinner. And then her family can head to a local park for a little more exercise—a park that you refurbished. "The USOC and 16 of its national governing bodies will be providing opportunities for nearly 2 million kids across this country to participate in Olympic sports in their own communities. They’re going to have access to everything from basketball and tennis to things like fencing and judo—maybe things that kids usually don't have access to. "They won't just be learning athletic skills; the cool thing is they’re going to be learning life skills as well—like discipline, teamwork, and of course, the importance of giving 100 percent to everything that they do.